You can create a free blog and start publishing content instantly with a free publishing platform. You can select from multiple available platforms like WordPress.com, Blogger, Tumblr, Google+, etc. We recommend using WordPress.com as it is easy to use and can be tranfered to selfhosted blog at WordPress.org for more features, customisation and monetisation. Based on your blog subject provide details to WordPress and select a theme for your website. If you are still confused with a name for your blog, you can start a blogging with your own name (Like Miss Malini, Neil Patel). 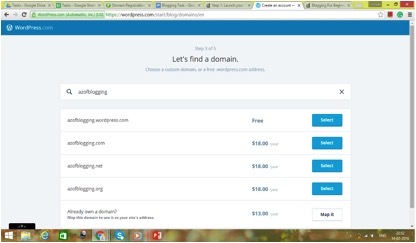 You can start a free blog with .wordpress.com added to the domain. Dont worry, you can switch this from a .wordpress.com to a selfhosted domain anytime you like. Get Started with the Free Plan! Your own WordPress.com address, like example.wordpress.com. 3 GB of storage space for uploading images. Basic customization: add pages and widgets, upload a custom header or background, integrate with your social accounts, and more. Staff, volunteer, and community support in the WordPress.com forums. This plan provides no video storage and may show ads on your site. This is a step-by-step guide to optimize your Linkedin profile. I am using it myself. I think it is relevant for you as well. It will take 3 hrs of your time.